LOS ANGELES -- General Motors Co. tomorrow is expected to announce that the rollout of the new Chevrolet Volt plug-in hybrid will take place in selected U.S. markets -- not as a national launch. GM CEO Fritz Henderson is set to make the announcement at the Los Angeles Auto Show. 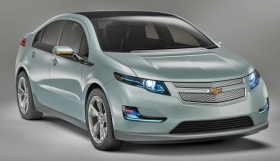 The Volt is one of the most anticipated vehicles in the history of GM, which reorganized during a 39-day, government-sponsored bankruptcy this past summer. Yesterday, Chevrolet division President Brent Dewar said here that GM is looking at a number of factors to determine which areas get the Volt first. It's almost certain that California will be one of the rollout states, but Dewar would not confirm that. California residents were big fans of GM's EV1 electric car. GM produced and leased about 1,000 EV1s from 1996 through 1999. Dewar did not say how many Volts GM expects to sell. “Our biggest problem is infrastructure,” he said.